Many dogs enjoy the cold weather and love to play and romp in the snow but when temperatures plummet spending long periods of time outside can pose health risks for dogs. Veterinary experts at the American Veterinary Medical Association say that our dogs’ cold tolerance can vary based on their coat, body fat stores, activity level and health. When frigid temperatures force dogs to spend long periods of time indoors, they can suffer from cabin fever just as we do. According to the Animal Behavior College (ABC), being housebound for extended periods can result in restlessness and dogs can also get bored and depressed. Having a dog walker take your dog out on an adventure is a great way to break up the day. 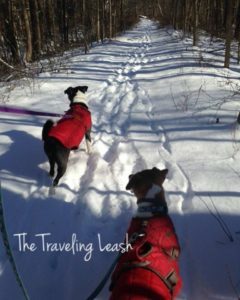 During winter months The Traveling Leash dog walkers adjust visits according to the weather. When temperatures plummet to dangerously low levels all dogs are taken out just long enough to do their business and then it’s back inside for playtime and lots of loving. This interaction helps to break up a dog’s day when home alone. When the weather prevents you from giving your dog sufficient outdoor exercise indoor doggy daycares can be an excellent way to provide exercise. Enrolling your dog in a doggy daycare a few days a week or even for half a day helps release pent-up energy as they get to play with other dogs. At the Playtime Doggie Daycare in New Windsor dogs exercise and socialize in a crate-free environment. The daycare center has separate areas for large and small dogs and lots of fun play equipment with cots available for naptime. 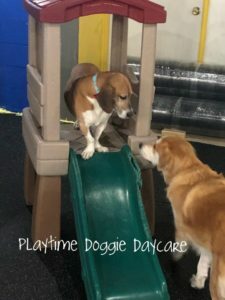 “Spending time at our daycare interacting with staff and with other dogs provides wonderful mental and physical stimulation for dogs who might otherwise be forced to spend long hours at home alone,” said Erin Talarico, owner and operator of Playtime Doggie Daycare and The Traveling Leash. Mae enjoys hanging out on play equipment at Playtime Doggie Daycare. Playtime Doggy Daycare doesn’t discriminate against any particular breeds but all dogs must pass a temperament test to ensure a safe and fun experience. Some owners opt to drop their dogs at doggy daycare five days a week, while others prefer to mix it up between daycare and dog walking services throughout the week. Either way, the dogs get exercise and time outside the home for a portion of the day. Dogs of all breeds require daily exercise and mental stimulation to take away stress and prevent destructive problem behaviors. Professional Dog Trainer Ken Nolte gets lots of calls in December from families who got pups for Christmas and need help with behavioral problems. These problems can escalate when puppies don’t get enough exercise outside because of ice and snow or frigid temperatures. Nolte—who also does temperament testing at Playtime Doggie Daycare—said the solution is to provide the dogs with alternatives such as engaging them in short training sessions. Having a trainer like Nolte come to your home is wonderful because you can work on issues that are occurring inside the home. Nolte recommends family members engage with the dog a few times during the day by asking for sit stays, downs, or by playing hide and seek with family members. Another training option is to take your dog to a group obedience class. This could be beginner classes for new puppies or advanced training for dogs who have already been to school. You might also consider teaching your dog new skills. The American Kennel Club (AKC) Canine Good Citizen (CGC) program lays the foundation for other AKC activities such as obedience, agility, tracking and performance events. The program is open to purebred and mixed breed dogs and is designed to enhance the bond between owners and dogs. Professional Dog Trainer and CGC Evaluator Jennifer Culver, who owns Vom Kugelblitz Kennels and Focused K9 Training in Catskill, NY, will offer a CGC Seminar at Playtime Doggie Daycare on February 16. “The seminar is for people who have already done obedience training with their dogs and just need to brush up on the basics for the CGC test,” Culver said. A lot of homeowners insurance companies will actually give you a discount if your dog has CGC Certification. Many people use the certification as a jumping off point for entering other competitive sports or enrolling in therapy dog programs. The training required to earn CGC certification is wonderful if you want a well-mannered dog who can accompany you anywhere dogs are allowed. To find the best games for your dog, research his or her breed traits. For example, Labradors were bred to retrieve small game and objects and will respond well to fetch or hide-and-seek types of games. Herding group dogs, such as border collies or Australian shepherds were specifically bred to herd livestock. For these dogs, many trainers recommend laser-pen beam games. By moving the beam in various directions, dogs get the sense that they are “herding” the beam. Anyone who shares a home with a member of the hound dog group like beagles or basset hounds knows that they are motivated by scent. These dogs can be kept busy searching for treats that have been hidden around the house. “Fun nosework training can be done with pet dogs that allow people to actually enter competitions and test their dog’s abilities,” said Culver, who has been working with search and rescue dogs as well as police, narcotics and bed bug dogs for more than 10 years. Culver plans to introduce nosework classes at Playtime Doggie Daycare. This is a great way for owners to learn how to get their dogs interested in nosework activities that can keep them busy around the house on frigid winter days. In the nosework classes, dogs are introduced to odors and then taught search patterns. They receive praise or a reward when they track down the odor. Nolte cautions against allowing dogs to use squeaky toys as chew toys. Rawhide bones are a common treat for dogs but are not recommended by many veterinary experts. According to veterinarians at WebMD, in addition to posing choking risks, rawhides can cause blockages and digestive irritation. Instead, Nolte recommends his clients get bully sticks or flavored bones such as Benebones or Nylabones. Both Nolte and Culver recommend stuffing Kongs or uncooked marrow bones with peanut butter, dog treats or yogurt. These can be frozen overnight so that they will entertain your dog for a longer period of time when home alone. Ice cubes can also satisfy a dog’s chewing instincts. Nolte recommends filling an ice cube tray with chicken broth. This is especially good for puppies who are teething, the trainer said. For larger dogs consider filling a bowl with chicken broth and freezing overnight. 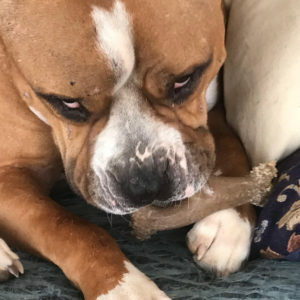 Ken Nolte’s mastiff/boxer mix, Ben, enjoys chewing on a Benebone. Depending on the breed puzzle toys can provide fun entertainment. You can find a large round-up of puzzle toys on Amazon along with star rating and owner reviews that might help you in deciding if one of these toys is right for your dog. In general, though, Nolte is not impressed with puzzle toys. Instead, Nolte suggests filling a cupcake tray with your dog’s favorite treats. Then lay the tray on the floor and cover each compartment with a different size ball. The bottom line is instead of being depressed that you and the dog cannot get out as much on those cold winter days take advantage of this time of year to work on training and bonding activities. “When owners take the time to work on training during the winter it will make springtime with your dog that much easier,” Nolte said.